Stephen Hausdorff's zany comic returns once more to Nintendo platforms after leaving a bit of a sour taste on Wii U. No small feat considering Dolores Entertainment still completed this game’s production despite a failed Kickstarter campaign. But has the flavour (or lack thereof) improved since the previous serving? The sugar lobby must be really happy with the plot here, since it makes ‘Evil Broccoli’ the top antagonist and his army is mostly made up of vegetables and assortments of other healthy food items. Enter five sugar-overflowing heroes: poster boy Ace on his cornetto, Sailor Twister, Super Cream, Rei Tou and Hima (a yeti who rides a Funny Feet ice cream). Of course, each one has different weaponry and upgrades, but you will only discover them by actually trying out each character until you find your favourite flavour. In fact, this Switch version goes as far as omitting their names on the selection screen, already a step back from the previous version. 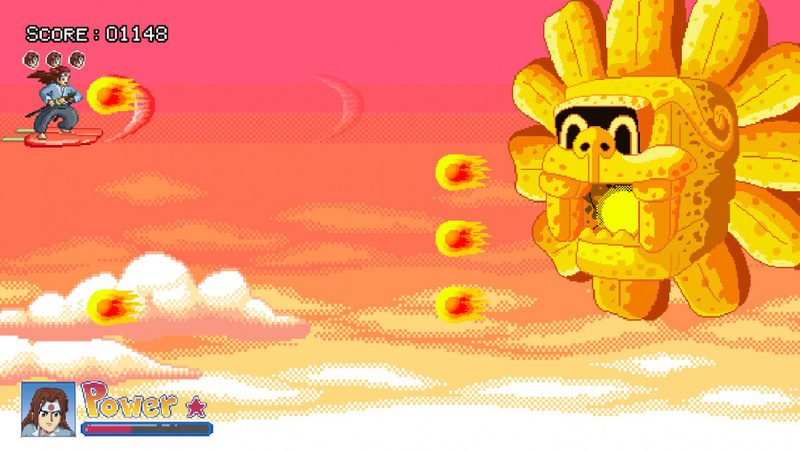 The game is a horizontal left-to-right scrolling shmup and is made up of six thematic stages, unsurprisingly guarded by a screen-filling end of level boss. You need not worry about the brightly coloured backgrounds, despite some baddies actually standing on top of them you can’t crash into anything. This is a one-hit kill kind of cute-’em-up so be prepared for some Gradius-style frustration when you die and find yourselves back to the underpowered, default weapon mid-level - or worse, mid boss fight. Death comes from contact with enemies or enemy bullets, and this is where one of the games major shmup design sin pops up: The enemy bullets are not only purple which blends with the brightly coloured backgrounds, they actually can hide behind pickups. 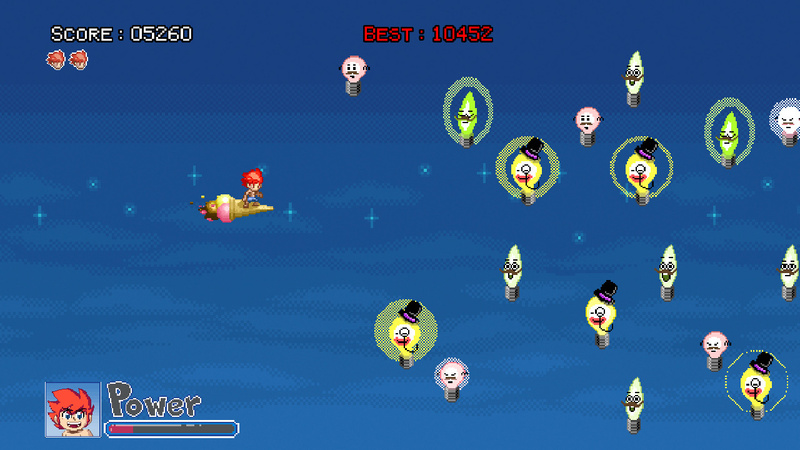 Since every enemy you kill turns into a collectable gem that (not unlike the bells in Parodius) speeds towards the left side of the screen, it is incredibly easy to lose track of bullets and die while trying to rack up point on collectibles. 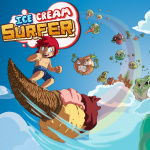 More grief ensues because you can also die by crashing into the power-up containers that you must destroy prior to collecting the ice cream weapon power-ups. It is a real shame that such oversights really bring down the whole package, with some polish we can clearly see untapped potential here that's never delivered. Despite being exactly the same game as we previous encountered on Wii U, thankfully auto-fire now comes as standard from the get-go. Like most game of the genre, having a second player on the screen not only doubles your side’s firepower as it makes managing the enemies much easier. Graphics are bright and colourful while music and sound effects are competent. The game’s loop will take about 45 minutes to one hour to complete, mostly due to infinite credits and generous checkpoints (with the exception of the last level which you need to clear from the beginning to end on a single credit). Your reward for clearing the game is unlockable volumes from the titular comics and sketches from the author. Despite humorous, each character’s unique smart bomb attack often fails to clear the entire screen and can even miss bosses entirely, making you wonder where exactly the ‘smart’ bit went. All our criticism may sound a bit harsh when you consider the mobile origins of the product and the low price point which is being sold on the eShop, but it is impossible to overlook the amount of shmup sins it commits in such a short amount of playtime, aggravated by the coexistence of other scrolling horizontal shmups on the system such as Sine Mora EX or the nearly flawless Steredenn: Binary Stars. 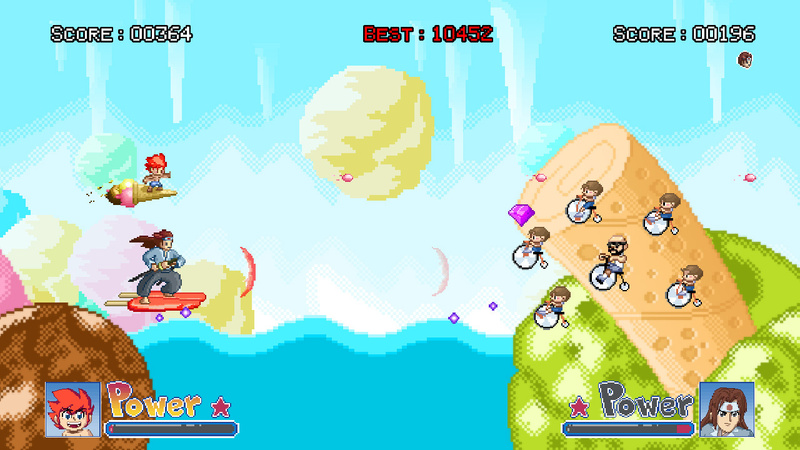 Ice Cream Rider Is far from being a terrible game, but several alarm bells ring when you get down to playing it. While delivering all the classic tropes one would expect from a cute-’em-up, it resembles Commodore Amiga games where western developers attempted to mimic the Japanese arcade offerings found on the arcades to varying degrees of success. But unlike Wii U, Switch is shinning brightly with superior shmup offerings, both old and new of every subgenre you can think of. So we can't recommend you give this a spin unless you are a fan of the source material or accept its shortcomings as part of the budget price point. Eh, a Wii U port Indie game ? A port of a 4 year old mediocre game... It's one of those that shouldn't probably be on the eShop. And I cannot understand why broccoli is the posterboy for "disgusting vegetables" in media. Steamed broccoli is delicious! @Anti-Matter A Wii U port of a mobile port to be accurate. @SmaggTheSmug Different people have a different sensitivity to bitterness. Believe it or not, broccoli can taste extremely bitter to some. Not to me, I love it, but that's how it got a bad rep. Evil broccoli. @finalstan I know that many people simply boil and overcook it, making it a disgusting, flavorless mess... I'd never think of broccoli as bitter though. That's a new one. You know, in Powerpuff Girl episode, there was a Broccoli Alien Invasion episode. To be survived in that invasion, kids and Powerpuff Girls had no choice but.... Devour all that Broccoli Aliens like Barbarian ! Well, hit me with a freeze pop. Thankfully, the Switch already has tons of superior horizontal shoot'em up alternatives like Tengai, Blazing Star, Sol Divide and soon Thunder Force IV. @EmirParkreiner I either missed the Thunder Force IV announcement or somehow forgot about it. That's great news though!